As follow-up of the tutorial, online training materials and video lectures will be made available. If you are interested in receiving an update on when those lectures are accessible, please mail us at info@fcg-net.org. The journal Computational Linguistics just accepted a review by Nathan Schneider (Carnegie Mellon University) and Reut Tsarfaty (Uppsala University) of the book “Design Patterns in Fluid Construction Grammar”. You can access the full text here. New book on FCG published! 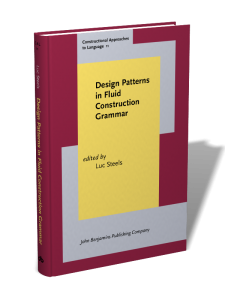 The book Design Patterns in Fluid Construction Grammar (edited by Luc Steels) is now available at John Benjamins! This book is the first extensive publication on FCG. In addition to general introductions, it gives a number of concrete examples through a series of linguistically challenging case studies, including phrase structure, case grammar, and modality. The book is suited both for linguists who want to know what Fluid Construction Grammar looks like and for computational linguists who may want to use this computational framework for their own experiments or applications. Together with the book, a new open-source release of Fluid Construction Grammar has been published on this website. This new release contains sample code and demonstrations that illustrate the papers in the book.